THIS ITEM IS NOT AVAILABLE AT PRESENT. WE WILL NOT BE GETTING ANYMORE Batman Harley Quinn 6-Inch Metals Die-Cast Action Figure. From the Batman collection by Jada Toys. Batman Harley Quinn 6-Inch Metals Die-Cast Action Figure. 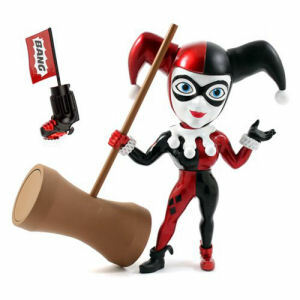 Harley comes with oversized pistol and hammer. Each die-cast metal and plastic figure stands about 6 inches tall and comes packaged in a window display box. Jada Toys Batman Action Figures shipping from Canada. No Surprise Border fees or Customs!